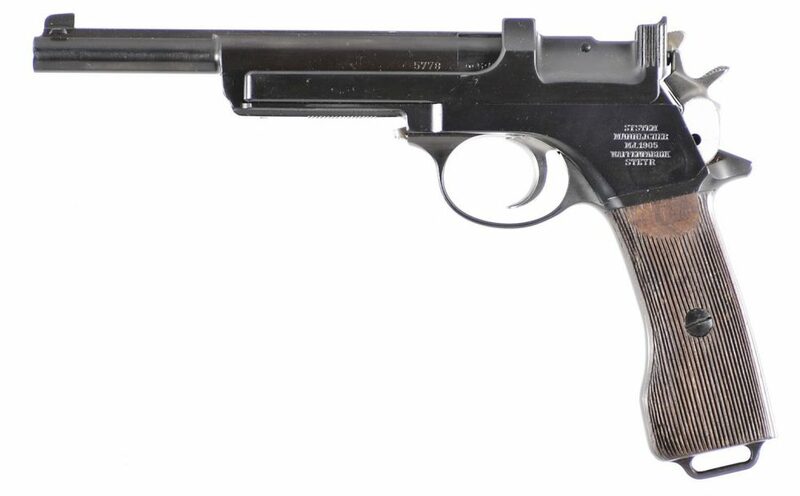 Designed by Ferdinand Ritter von Mannlicher who is famous for his work with Otto Schönauer in creating the Mannlicher-Schönauer rifle, the Mannlicher automatic pistols of 1901 and 1905 were designed and manufactured at the same time Georg Luger was working on his designs and John Moses Browning was creating the series of pistols that culminated with the Colt 1911. 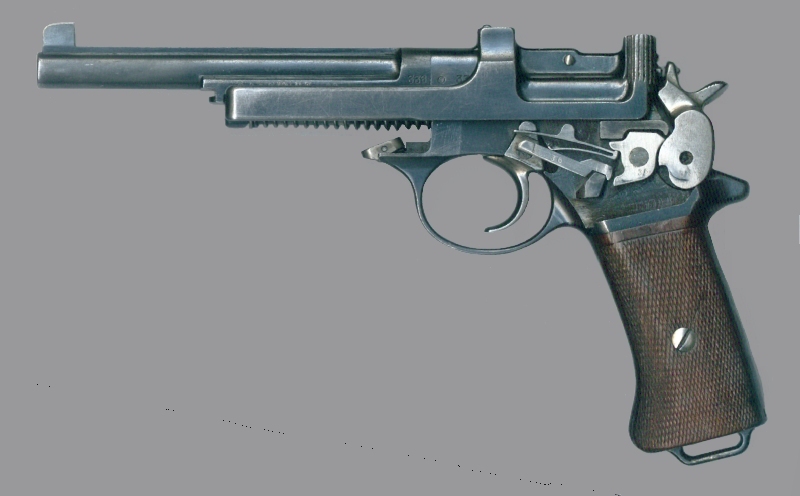 In military trials the Luger finished up being perfected and accepted by the Swiss first and then Germany and the Mannlicher pistol tended not to do as well especially in endurance trials which required firing 400 rounds continuously without need to stop for cooling or cleaning. This picture and the one at the head of our post is of the Mannlicher Model 1905 Argentine Contract up for auction by Rock Island Auction on August 5th 2016 9:00 AM CST, USA. (Both pictures courtesy Rock Island Auction). The Mannlicher Model 1905 Argentine Contract pistol pictured above and in the picture at the head of this post is coming up for sale by Rock Island Auction on 5th August 2016 at 9:00am CST, USA time. Despite not having been adopted as an issue military pistol in Europe a significant number of the Mannlicher Model 1901 pistols were privately purchased by officers in the Austro-Hungarian Army and this is not surprising. They are a slim handgun that fits naturally in the hand, natural to point and aim, ruggedly simple, and made with the usual excellence of firearms made by Steyr of Austria. The lock-work of the Mannlicher Model 1901/5 is kept simple and is as a consequence reliable. (Picture courtesy Wikipedia). Although the hammer assists in delaying the movement of the slide when the pistol is discharged this is really a straight blowback design that was intended to fire a relatively weak cartridge of 8mm diameter. The pistol was later adapted to fire a slightly smaller but more powerful 7.63mm Mannlicher Automatic cartridge. This cartridge fires a steel or cupro nickel full jacketed bullet of 85grains (5.5grams) at a muzzle velocity of 1070 ft/s (326 m/s). So it is of about the same power as the .32 Harrington and Richardson Magnum. Slide fully open. The latch visible on the right side of the grip is for unloading the fixed integral magazine. (Picture courtesy Wikipedia). The trigger of the Mannlicher Model 1901/5 is typically very crisp and likely one of the contributing factors in the pistol having become popular with Austro-Hungarian Army officers. Loading the pistol is not what most American pistol shooters would be familiar however as the Mannlicher Model 1901/5 has a fixed magazine that is loaded from the top by a stripper clip. This is slower than dropping and changing a detachable magazine but arguably faster than having to take out and re-fill a magazine if you’ve only got one as many carriers of automatic pistols would. 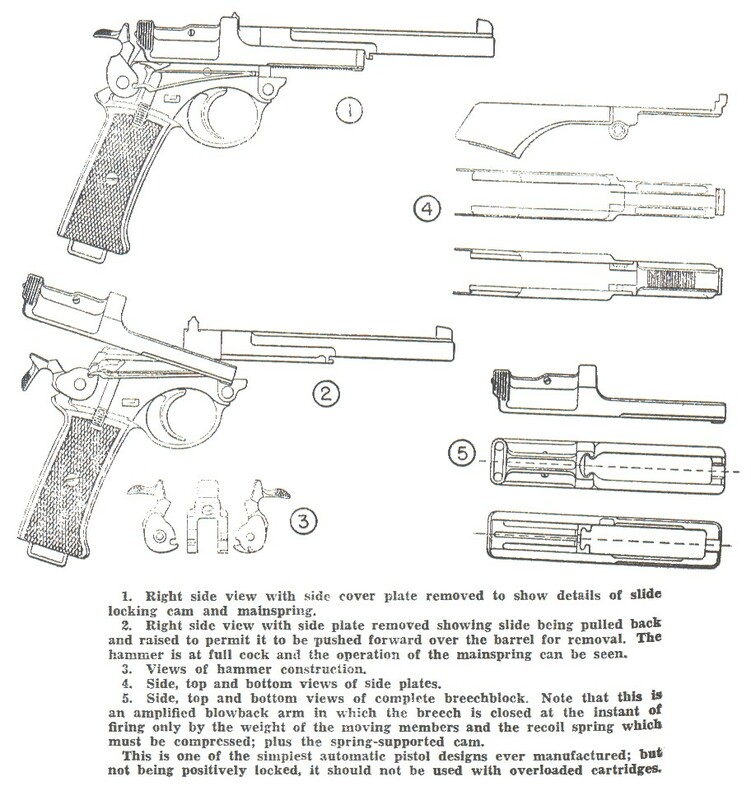 To unload the Mannlicher Model 1901/5 the action is held open and then the latch on the right side of the grip is pressed down. This releases the cartridges from the magazine and they will spring out so it is necessary to ensure there is a waiting hand strategically positioned to catch them. 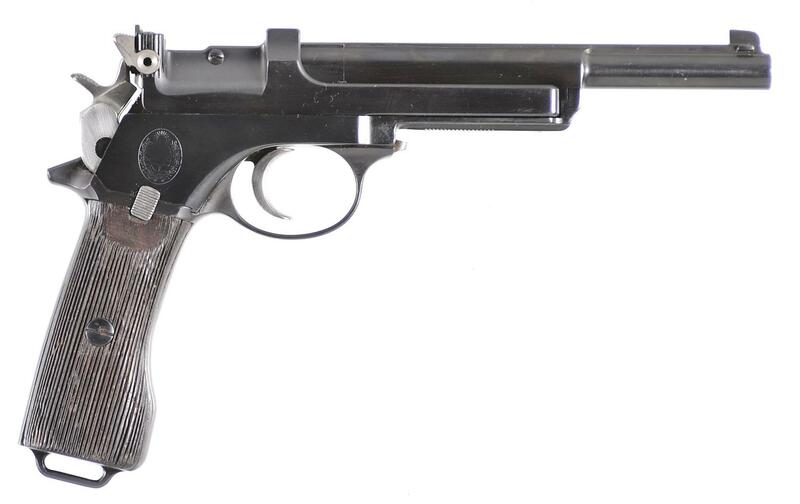 The armed force that decided to adopt the Mannlicher automatic pistol was that of Argentina who adopted the pistol in 1905 along with the 7.63mm Mannlicher Automatic cartridge (7.63x52mm). 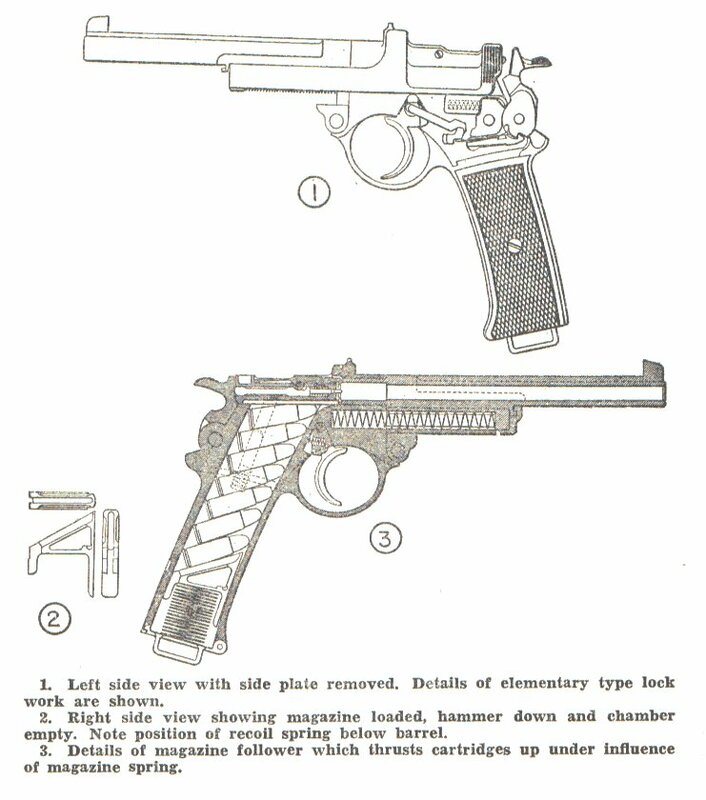 These pistols are referred to as the Mannlicher Model 1905. They initially purchased 1,020 pistols along with over a million cartridges, holsters and accessories. Subsequently they purchased another 5,000 pistols and three million rounds of ammunition, along with holsters and accessories. The Argentine military continued to order more of these beautiful pistols acquiring around 10,000 in total.